4.5 stars. If you put The Time Traveler's Wife, The Lake House, and The Butterfly Effect into a blender with an extra helping of sweetness, you'd come out with something similar to Time Between Us.If only we were separated by this distance. But we're not. We're separated by this distance plus seventeen years.Funny thing is, I wasn't a huge fan of Time Traveler's Wife, yet I still loved Time Between Us. It was just what I'd been looking for in YA/NA contemporaries ever since reading Anna and the French Kiss, but hadn't been able to find. Maybe there was nothing extra-special about the writing or the story, but the simplicity is most likely what appealed to me the most. There were no love triangles, no extra helpings of cheese, no simpering heroines, no annoying tendencies. This was a love story in its purest form, and I fell hard for the telling of it.I was able to overlook a pretentious name like Bennett Cooper (the names by themselves are fine, but together it looks douchey), or to even skip right over a mention of a borrowed pencil feeling like a connection worth mentioning. The reason why is because the silly little things were simply that - little details which didn't detract from the greater story.All of my time spent reading this particular story felt like time worth investing. As I got closer to the end, my nervousness grew to a point where I didn't know how I would be able to handle if these two sweet people were not able to be together. Testing fate, toying with it, may not have any obvious impact at first, but eventually something has to backfire.It's not often that a love story comes along and manages to get me as invested as this one did. 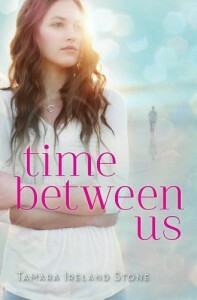 I loved every moment of this journey and am looking forward to book 2, even though I think this book ended at a good point.If you're looking for a love story which is so beautifully handled, with less silly/manufactured angst, and two characters who feel as if they could be genuine, then you'll want to give Time Between Us a go.